Watering your lawn is one of the most important parts of overall landscape care. If the grass doesn’t receive enough water, you’re left with patchy areas and dry spots that are difficult to cultivate back into life. Lawn sprinklers are your best solution for an ailing yard. These sprinklers aren’t the typical fixed products that require extensive excavation into your lawn. Hose-end sprinklers are versatile and simple to operate on any grassy area. Connect your lawn hose to it, and you have an instant water distributor. However, there are many sprinklers on the market today with countless variations. Protect your lawn by researching and buying the best lawn sprinkler for your budget. A lush and green lawn is in your future. When you have a medium- to large-size lawn, watering it without integrated sprinklers can be tricky. 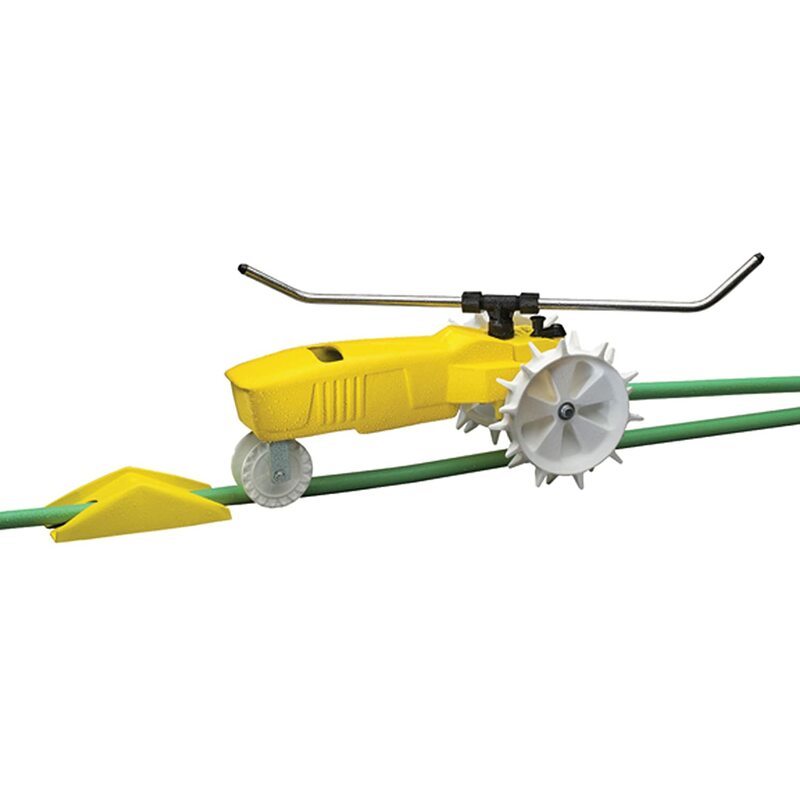 Your best solution for a lush lawn is the Traveling Sprinkler by Nelson. This watering device looks more like a tractor going about its farming business than a standard sprinkler. In fact, many consumers appreciate the whimsical appearance of this product and its accurate coverage of their lawns. Although you may not be familiar with a traveling sprinkler, you’ll instantly appreciate its movement and functionality across any lawn area. Take a moment to look at each feature that this sprinkler provides for your property. As you look at the Nelson product, the first feature that stands out is the bright-yellow paint. This delightful color is powder-coated paint, which offers you a chip-resistant surface through every watering season. Underneath the yellow hue is the cast-iron body. At 18 pounds, this sprinkler is relatively heavy, but it’s necessary for its widespread application. Simply set it out on the lawn and allow it to work its way around the area. Part of this sprinkler’s durable nature is the mechanical components. The white wheels that flank the product are large and spiked. As the sprinkler moves across the lawn, you’ll see the spikes making gentle contact with the grass. If the spikes do make an indentation in the soil, this action will only help with lawn aeration over time. If you look inside of the sprinkler, you’d see a system of gears that tells the product when it’s time to work or shut off. This ingenious design makes this sprinkler an automatic gem. The sprinkler has a spinning “S” tube with small holes that accommodate the water. As the sprinkler moves about 200 feet down your property, it’s capable of distributing water between 15 and 56 feet. Adding up the square footage that this sprinkler can cover will equal about 13,500 square feet. These specifications are outstanding for a portable sprinkler system. The manufacturer reports that the sprinkler has three speed settings, including high, low and neutral. The neutral speed is more of a self-propelled scenario where the water pressure simply controls the traveling speed. Set the sprinkler to low, and you’ll watch the product move about 21 feet per hour. This setting allows you to water at a deep level because more water strikes the ground in any one area. For a faster watering time with less water saturating the soil, select the fast speed at 37 feet per hour. This speed allows you to complete a watering session in less time but with widespread coverage. You might wonder what the included ramp is used for during the sprinkler’s travels. In fact, this ramp is the shutoff point for the product. Place it several feet away from the hose’s end point and where you want the watering to stop. As the sprinkler encounters the ramp, its front wheel will rise onto the slope. The sloping action presses on the sprinkler’s internal valve, which instantly shuts off the water. You don’t have to worry about waiting and manually shutting off the water anymore. Basic mechanics and physics make this sprinkler easy to use. Some consumers have been concerned about their Nelson sprinklers being effective on a sloped lawn. In fact, this sprinkler can reportedly take on some sloped areas with no problem. It simply needs enough water pressure within the hose in order to move the sprinkler forward. If you have a steep-slope lawn, however, you’ll need to experiment with different sprinklers. There is no maximum slope specification offered by this sprinkler’s manufacturer so it may or may not work for your needs. Ideally, borrow a Nelson sprinkler from a friend to try out the process before purchasing one. Although this sprinkler has a heavy-duty construction, consumers report that it’s incredibly quiet. Unlike other spraying mechanisms, the Nelson unit barely makes a whisper as water flows out of the spray wand. Reportedly, you’ll only hear the drips of water coming off of the grass leaves. If you want a long-lasting sprinkler with an interesting mode of transportation, invest in a Traveling Sprinkler by Nelson. Your lawn will be greener than ever with its spraying accuracy. You may be an old-fashioned yard enthusiast who simply wants an oscillating sprinkler. These products are reminiscent of the days where kids would jump a stream of water as it saturated the grass on a hot, summer day. The Aquazoom by GARDENA is a perfect throwback product with a modern design. This sprinkler merely oscillates from side to side with a fan of water following its every move. You’ll be delighted with the features found in this sprinkler as you research various options. When you receive the sprinkler, you may notice that it’s very lightweight. It only weighs in at 2 pounds, which makes this sprinkler easy to place on the lawn by anyone in the household. This lightweight sprinkler also comes with a two-year warranty. Defects and other issues will be promptly covered by the manufacturer. Ideally, you should keep your receipt and register the product with the manufacturer when you buy it. In the future, there won’t be any confusion over ownership dates. 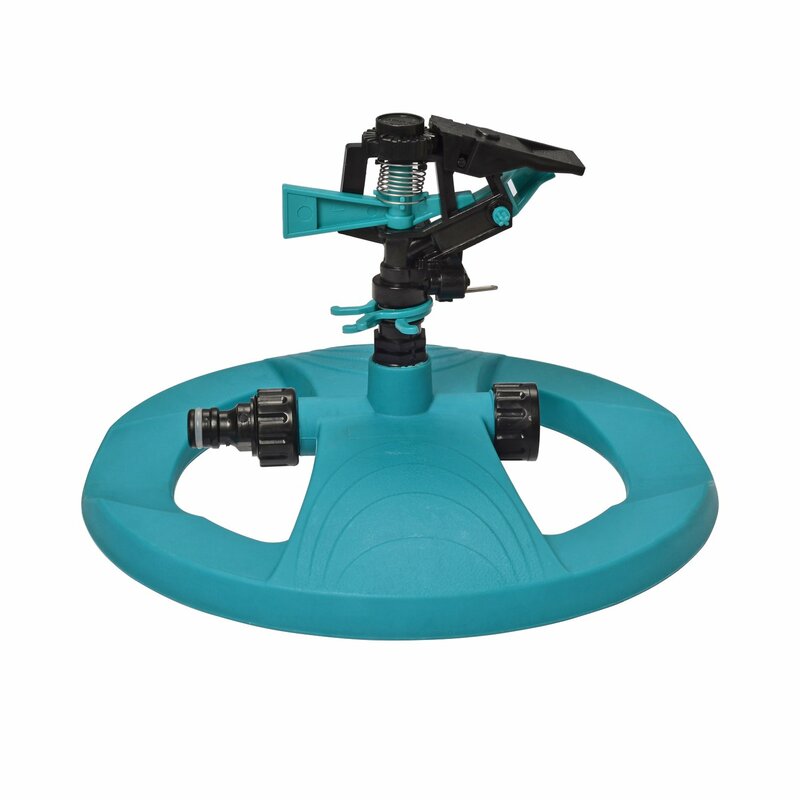 Consumers are largely pleased with the adjustable features built into the Aquazoom sprinkler. The water’s spray length is easily adjusted between 23- and 69-feet. A unique adjustment that’s not seen in every product is the spray’s width. Change this value from 13- to 55-feet with just a small turn on the adjustment knob. Controlling both the water’s length and width means that you can keep the spray where it’s supposed to be. Watering the driveway is just a waste of water. Consumers usually purchase this sprinkler when they have a rectangular lawn. The straight-edge water tube will only spray this area shape in an efficient manner. If you have an asymmetrical, circular or oversize lawn, this sprinkler won’t produce the best results. In these cases, the water pattern won’t cover every area. You’ll have some dry patches that must be manually watered. Consider your yard’s size and shape in order to make a smart purchasing decision during sprinkler shopping. Some consumers have asked about controlling the water’s height with a knob on the product. The Aquazoom doesn’t have a height adjustment, but you can easily create some control by simply changing the water pressure. By using the water valve, alter the flow volume entering the sprinkler. Over time, you’ll get to know the best setting for your lawn. Overspraying will be a thing of the past as a result. Plastic is a versatile material that benefits many products, including the Aquazoom. Consumers report, however, that the plastic isn’t as durable as metal-sprinkler designs. After several years, the sprinkler breaks down from sunlight and water corrosion. It’s important to note that only a few consumers have complained of this issue. Other users may take better care of the sprinkler between seasons. It’s possible to rely on the warranty, maintain the unit and benefit from several years of use with a GARDENA sprinkler. Every customer will have a slightly different experience with the product. The sprinkler’s spray nozzles are very tiny openings. In time, they might become clogged with dirt or grass pieces. Try to wipe this sprinkler down after each use and specifically before you store it for fall or winter. Although some consumers have complained about parts wearing down over time, it’s possible to prolong the sprinkler’s lifespan with basic cleanliness. 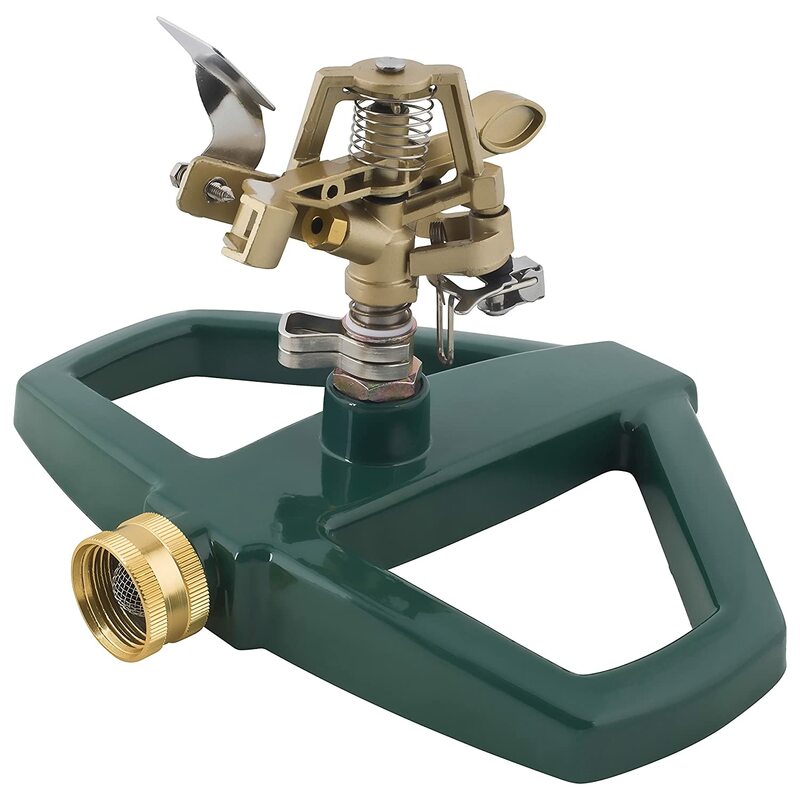 Treat the GARDENA sprinkler with care, and you’ll have a durable product for many years. The classic, sprinkler design is easily recognized with the Impulse Long Range product by KMASHI. 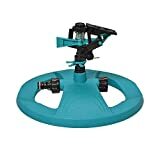 With a turquoise-colored base and black sprinkler head, this watering device is a time-tested product that thrills both yard enthusiasts and children alike. Although this sprinkler is rated as a third-place choice, there are very few issues reported with this product. Read about all of the specifications that are inherent to this product, and you’ll become a fan of KMASHI in a heartbeat. You might be concerned that the Impulse sprinkler only weighs around one pound, but it places this weight in a strategic area. The circular base surrounding the rotating head holds two, lead weights. They’re situated on opposite sides of the circle’s perimeter so that the entire product is sturdy during use. The remaining assemblies are built out of plastic. It’s the lead weights that hold the sprinkler down while the plastic protects the moving parts from the sprayed water. Most consumers simply want the full-circle action offered by the Impulse sprinkler. It will turn a complete, 360-degree angle so that the entire lawn is covered. There is another setting that works best when the sprinkler is placed at the corner of the lawn. Press down on the product’s metal hook, and you’ve activated the 0-340 degree rotation action. You’ll be able to cover a large, grassy area without watering the adjacent patio or walkways. Set the sprinkler in an appropriate area, and watch the lush grass grow with deep-watering processes. The spray coverage area is adjustable along with the range. Adjust the sprinkler to spray outward to 32- or 42-feet. You may need to move the sprinkler at some point to cover other areas. As an alternative, you can hook up these sprinklers to others so that they can cover more area without the need to relocate them. Add a hose between two or three different Impulse sprinklers, and you have instant coverage across the entire yard. Consumers report some confusion when they receive the sprinkler, however. It actually comes in two different pieces. The instructions are clear about assembly, but many consumers are surprised by this packaging choice. Follow the instructions, or contact the manufacturer for any clarifications. The two pieces should just snap together. You’ll notice that there’s a screw control along the sprinkler’s outer assembly. Adjust this control in order to alter the water’s density when it exits the sprinkler’s head. You want a spray instead of a stream because this strategy saves water and efficiently saturates your lawn. Use a higher density setting on windy days, for example, while reserving fine sprays for still afternoons. When you receive your Impulse sprinkler, it comes with a detailed user guide and one-year warranty. Examine all of the parts upon arrival so that you start out with a perfect product. Everyday maintenance and care during use will make this sprinkler a handy tool in your yard. In most cases, consumers would buy this product again if they needed another one. 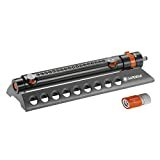 When you take a look at the Heavy Duty Metal Pulsating Sprinkler from Melnor, the first word that might come to mind is “tough.” This budget-friendly sprinkler is a stripped-down version of others on the market today. You won’t receive a fancy, outer assembly, but you’ll have the sprinkler functionality that you crave. Explore the options on this low-cost product that will still serve your lawn with quality care. This sprinkler’s tough appearance stems from its metal design. Its base is made of strong steel with brass making up the sprinkler’s finer details. All of these metal materials will hold up well against any moisture damage. The sprinkler can even be reasonably knocked around, and it will still operate as if it was brand new. It’s important to note, however, that some consumers have had some issues with product failure after only a few uses. There is no way to know the cause at this point. If you notice any issues with the Melnor sprinkler, it does come with a limited, lifetime warranty. Read the warranty information when you first pull the sprinkler out of the box. These warranties do have strict rules so that the manufacturer is protected from any fraudulent claims. Register your product, save the receipt and communicate with the manufacturer if any issues arise. This well-known manufacturer should stand up for their product, depending on the problem at hand. This pulsating sprinkler is meant for a relatively large lawn. It has a range of up to 50 feet, which covers a huge front or backyard. If you need to adjust this range, you can increase or decrease the water pressure at your wall valve. Some consumers report that the distance adjustment isn’t very accurate, however. You can check your water pressure and experiment with the setting when you receive the sprinkler. Enjoy a huge water arc with the Melnor sprinkler. Adjust it down to 30 degrees for a narrow, grass strip. Widen the arc to a full 360 degrees when you need the entire yard watered. Two clips along the sprinkler’s head makes the adjustment quick for any watering needs. Consumers report that the sprinkler doesn’t come with traditional instructions. In fact, the only information printed about the product is on its retail box. If you want to keep these instructions, you may want to cut them out of the box before you discard it. Alternatively, take a picture of the box and print it out. Although this detail is a bit disconcerting, it’s often overlooked because of the great service that this sprinkler offers your lawn. A major function that must be present in your chosen lawn sprinkler is consistent water coverage. The sprinkler should have the same water-volume flow moving through every nozzle opening. If water doesn’t flow at the appropriate rate, you’ll end up with both swampy and dry areas across the lawn. Take a look at online videos of the sprinkler in action. Watch a neighbor’s sprinkler working as well. Make a mental note of any flow aberrations during the watering process. Your new sprinkler should have a quality, water flow when it’s properly maintained. Avoid other products that you deem questionable in your mind. When you turn on your lawn sprinkler, you usually want to set it and go about your day. Babysitting the sprinkler shouldn’t be necessary in most cases. However, your watering process can be quickly ruined if the sprinkler won’t remain upright during its operation. Before you buy a popular model, take a look at the product’s weight. You want the sprinkler to have a stable base, and a weight of more than five pounds is usually optimal. If the sprinkler is lightweight, it must have a wide base in order to stay in position. Sprinklers can remain upright in gusty winds if they have a wide, lower section with some weight to the assembly. Although the kids may want the sprinkler to force water up and into the air by several feet, you don’t want this feature as an everyday, sprinkler function. 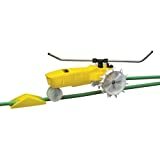 Ideally, you want a lawn sprinkler that can shoot water out to a specific distance with a low trajectory. This directional feature means that water is being delivered to the grass with the least amount of distance possible. When water is forced out in a tall arc, a lot of molecules are instantly absorbed by the sunlight. The intended grass doesn’t receive enough water, and you still pay high costs for this resource. A low trajectory and strong water flow will save you money while placing the water where it’s needed. Your lawn is distinctly different from any others in the neighborhood. With this fact in mind, you need to select a sprinkler that also reflects this concept. Choose a sprinkler that has several adjustable options. You’ll need adjustments for the water’s width, length and height. Some sprinklers have one or two of these options, and you’ll need to make a decision about which ones are the best for your lawn. These settings allow you to be in control of your water usage and efficiency in the yard. With the right settings, you might be able to save water compared to your previous use with a lower quality sprinkler. Regardless of the chosen lawn sprinkler, every product will break down over time. Water is a corrosive substance, and it erodes even the best materials. To prolong your lawn sprinkler’s life, try to wipe it down after each use. Use a rag to whisk grass pieces, dirt and other items off of the surfaces. You may even want to wipe it dry too. Clean and dry surfaces won’t wear down as quickly as constantly wet areas. It’s possible to prolong the sprinkler’s life for many more seasons ahead. With some expensive price tags involved, care and maintenance will only help your yard and budget in the end.